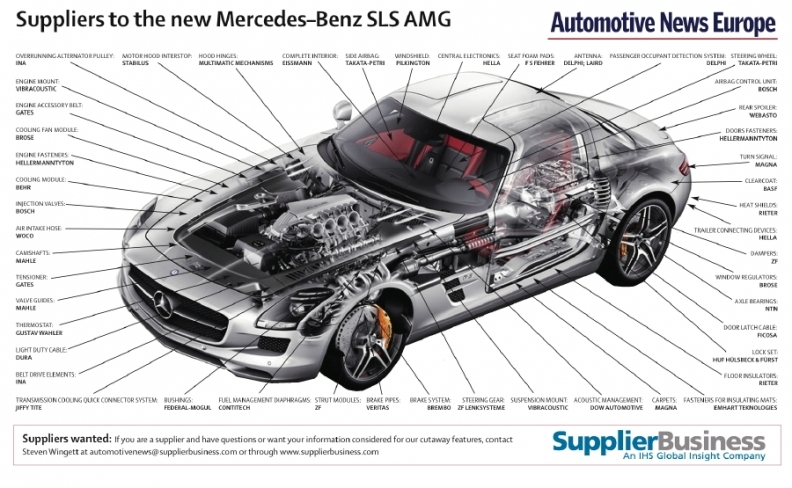 Numerous suppliers provide high-end interior features to the new Mercedes-Benz SLS AMG supercar. Danish car audio system specialist Bang & Olufsen a/s contributes a 1000-watt, 11-speaker sound system option. The high-end unit uses a microphone fitted into the roof lining to monitor interior noise levels. The data is used to independently regulate the volume setting for each speaker to compensate for extraneous noise (such as that generated during acceleration). Rieter Automotive AG further augments the acoustic profile by providing sound-insulating materials. Recaro GmbH & Co. KG provides lightweight, body-hugging, black leather shell seats to prevent occupants from sliding during sharp maneuvering. Magna Steyr supplies the supercar’s aluminum body, which includes its gullwing doors. Spring specialist Scherdel GmbH of Germany provides the support system needed for the smooth opening and closing of the doors. The two-seat supercar was conceived, designed and engineered by Mercedes-AMG GmbH, the German carmaker's in-house tuning division. The SLS AMG pays tribute to the classic 1950s Mercedes-Benz 300 SL, which is known for its gullwing doors. The SLS has a 6.3-liter, 571-hp V-8 gasoline engine that can accelerate from 0 to 100kph in 3.8 seconds. The car has an electronically limited top speed of 317kph. The SLS, which will be available in coupe and convertible variants, debuted at the 2009 Frankfurt auto show.